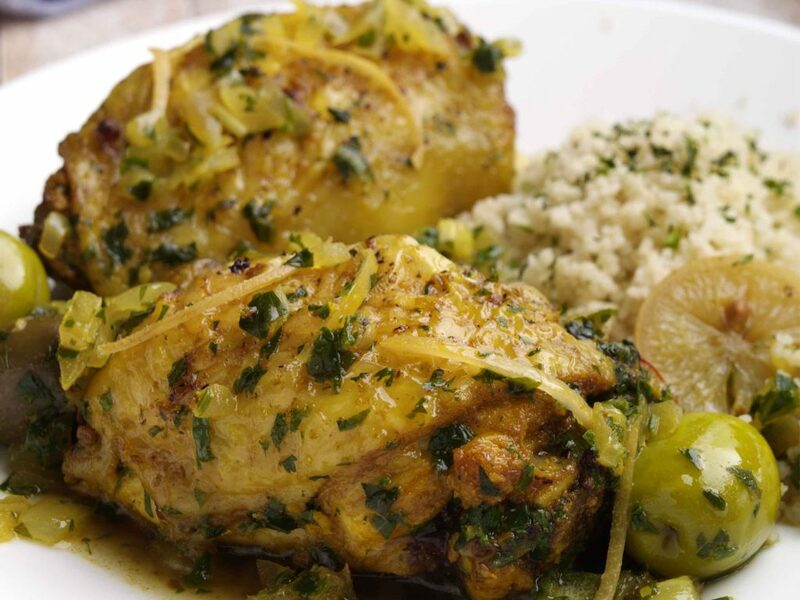 This dish is perhaps more than any other the classic of Moroccan cooking–Tajine of Chicken with Confit Lemon. It is justifiably delicious, and deservedly famous. From the Dar Les Cigognes cookbook. You can find this recipe and many others in our book, Tanjia Marrakchia. One of the keys to a successful dish is the chicken and how it is prepared. Best to find a healthy “beldi” chicken, not a young and insipid bird. Here is how you prepare chicken in the Moroccan way. Wash the chicken in salted water and drain. Pound the garlic and salt into a paste. Rub the paste into the body cavity and onto the flesh of the bird, or parts, at the same time pulling any excess fat from under the skin and from the neck and rump ends. Pull out the thin translucent membrane from under the skin of the breast. Rinse the poultry well under running water until it no longer smells of garlic (garlic rids the bird of any bitterness that might spoil the sauce; it also acts to bring out the flavour). Drain the poultry well. Rub it with the spices to be used in the recipe, a little butter or oil, and marinate overnight. If you are using a whole bird, it must be trussed. Trussing is easy: clip off the wing tips and discard; slip the ends of the legs into a horizontal incision made just above the rump, or slip the legs into incisions made on the lower sides of the breast. Although tajine cooking is one of the most familiar ways to cook chicken, they are often also spit-roasted, fried, or steamed. In the Royal Palace of Marrakech, just across the street, there is a huge room set aside for the spit-roasting of chickens. At least a dozen spits are slanted diagonally across piles of burning hot coals, each attended by two men— one to crank the spit, the other to paint the roasting chickens with spiced butter. 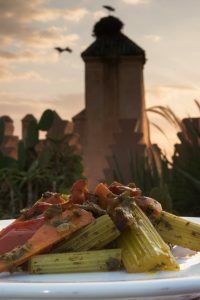 This is one of the great combinations in Moroccan cookery, and a dish that most often seduces our guests. There are many ways to prepare it. This is our way. Prepare the chicken as directed with 4 cloves of garlic and 2 tablespoons of salt. Rinse thoroughly. In a mortar, blend together the ginger, a little salt, pepper, 4 cloves of garlic, the pulp of a preserved lemon (reserving the peel), and a little oil into a sauce. Rub this sauce into the chicken and the livers. Cover with cling film and refrigerate overnight. The next day, place the chicken, livers, and sauce in a tajine. Add the saffron, onions, gum Arabic, a bundle of green coriander sprigs, and water. Stir and bring to the boil. Partially cover and simmer gently for 30 minutes. Turn and baste the chicken often. Remove the livers and mash them, then return them to the sauce. Rinse the olives. Cut the lemon peel into small pieces, and add along with the olives to the sauce for the final 15 minutes of cooking. Transfer the chicken to a hot oven to brown. Meanwhile, reduce the sauce at high heat to thick gravy, crushing the onions to get a uniform consistency. Remove the coriander sprigs. Return the chicken to the pan, turning to coat with the sauce, decorate with the lemon peel and olives, and serve at once. Serves 8 as part of a many course meal, otherwise 4. This recipe is a perfect example of the variety and depth of Moroccan salads. 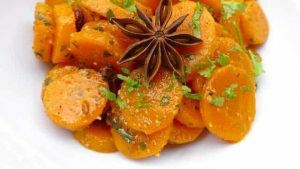 The cumin in this dish is strong, adding a wonderful nuttiness to balance the sweetness of the carrots. The star anise adds an aromatic note, adding complexity. Peel the carrots and cut them into lengths of about 3cm. Take these lengths and cut them lengthwise into eighths. Boil the carrot pieces in boiling salted water for 15 minutes along with the piece of star anise. Drain and place into the serving bowl. Using the finest mesh of a cheese grater, finely shred the garlic into the carrots. Add the cumin. Add the lemon juice, olive oil, and vinegar. Toss in the minced herbs. Mix together to blend flavours. Season to taste with salt. Serve warm or at room temperature. Serves 4. There are many delicious variations on this dish, including the use of fresh, thinly sliced hot peppers, cutting the carrots in rounds, etc. Use your imagination. 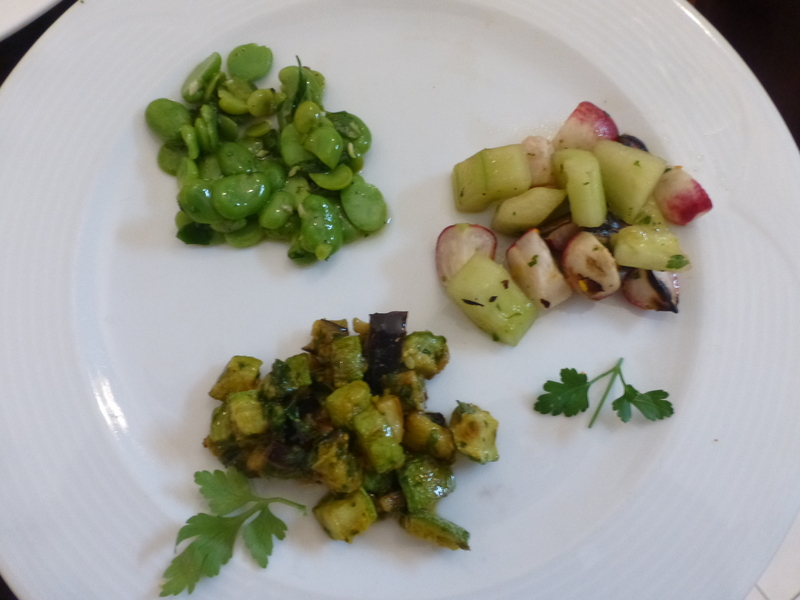 Another delicious and easy preparation from the culinary team at the Sanssouci Collection Cooking School in Marrakech. Why not book a class with us on your next visit to Marrakech? 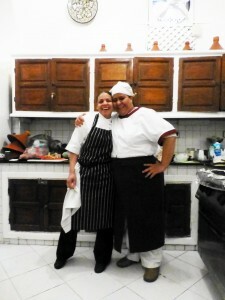 Have a look at the Sanssouci Cooking School page. We are very, very excited to announce that after many years of planning and thinking, we are finally opening our restaurant SALT-Marrakech. From Tuesday the 9th of February. Tables are limited. 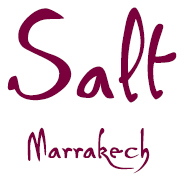 Please check out our site www.salt-marrakech.com and like our Facebook page Salt-Marrakech to stay abreast of new menus. We chose the name salt for our proximity to the Mellah, the ancient Jewish quarter of the medina, and also the arabic word for salt. For 15 years we have been holding daily cooking classes to teach traditional Moroccan cooking. Our love of Moroccan culture, as expressed through its food, is limitless. Through the school we have had the extraordinary good fortune to welcome some very well known chefs and foodies, thousands of passionate amateurs, amused participants, and children. It has been wonderful and will continue to be so. We have also wanted to explore Moroccan ingredients, techniques, and methods in new ways. Thus the genesis of Salt. We will be looking to serve the very best of traditional Moroccan cooking with a different approach. For the past year, we have been experimenting with formats, inviting talented chefs to come and cook with us, to help us to explore together Moroccan food. Have a look at our Valentine’s and February Menu. Our house team will be preparing a seasonal menu 6 nights each week. Additionally, we will be welcoming guest chefs who will bring their own vision and approach, and their own menus. For the next two weeks we will be doing a soft launch and welcoming diners at an introductory rate. From Mid-March, we will be hosting our first guest chef Najat Kaanache. Table reservations are required. Reserve by dropping us a line at tables@salt-marrakech.com. Talented chef Celeste Pianezzola recently joined the Sanssouci Cooking School in Marrakech to create an extraordinary meal. Inspired by her background as the uncrowned “Queen of the Grill” and the amazing array of ingredients on display in the local markets, she created a unique menu for guests of Sanssouci Collection in Marrakech. We had the great pleasure of hosting her for a pop-up dinner with the Sanssouci Supper Club in Marrakech. This is part of our ongoing programme to explore the possible future of Moroccan cuisine by inviting a series of international chefs to come to Marrakech, find inspiration from the local sites and sounds, ingredients, and food culture, and to come up with new and interesting dishes. Part Morocco, and part the inspiration based on past experiences, Celeste rose to the challenge in great form, creating a series of dishes as part of an extravagant evening of grilled specialties. There aren’t many people who would just agree to cook up a storm in a strange country, strange kitchen, and for people never met before based on an email exchange. Celeste is one of the few: a true adventurer. She’s an extremely talented and creative chef, great fun, and a fantastic photographer. Her talent and professionalism were in ample evidence as she not only cooked up a storm, but also entertained and demonstrated her skills with the grill. Her curiosity and passion about Moroccan food, spices, techniques and dishes was inspiring. Her sense of adventure and obvious love of Morocco helped to produce some extraordinary, and fresh dishes. Over the coming weeks and months we will be posting many of the recipes that she created here. One diner commented that she had never before enjoyed broad beans. Given that she ate them all, we had to include this delightful preparation. Shell the beans, blanch, and peel. Sauté garlic in oil over medium high heat until lightly browned. Toss in cumin seeds to toast 20 seconds. Add broad beans and toss to coat. Add half of chopped coriander. Add enough cold water to just cover, reduce heat to simmer for 15-20 minutes. Pour through fine mesh sieve and transfer to bowl. Dress with lemon juice, salt and pepper, and remaining coriander. Serve warm or room temperature. Serves 6-8 as part of a salad course (or 4 if served as an individual salad starter). If you would like to join our supper club in the future or join us for a cooking class, please drop us a line at info at sanssoucicollection.com. If you are a chef, we would love to hear from you. 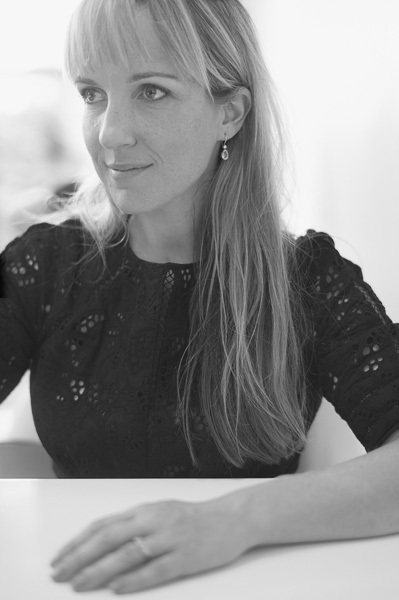 The Sanssouci Cooking Class, Marrakech, Morocco – Presents a Pop-Up Supper Club with chef Jane Campbell Howard, 27th and 28th February, 2015, at boutique hotel Dar Les Cigognes in Marrakech. The Sanssouci Marrakech Cooking School in Morocco is hosting a Supper Club at Dar Les Cigognes featuring chef Jane Campbell Howard. This is part of our ongoing exploration of Moroccan Cuisine and Culture. Jane knows Morocco and Moroccan cuisine and ingredients, having worked and lived here for several years. The combination of her classical training, adventurous spirit, and knowledge of Marrakech’s markets and produce, should make for interesting culinary alchemy! We are heading into a season with beautiful produce, which opens up some very exciting possibilities. In keeping with our desire to give the chef maximum freedom and room for last minute inspiration, we are not pre-announcing the menu. This is an intimate event, and places are limited to just 24 guests, with priority to resident guests, so please drop us a line at info@sanssoucicollection.com or call +212 524 38 27 40 or 47 67. Jane will be cooking on two nights only. Dinner is 600 dhs per person including drinks. Jane studied at the outstanding Prue Leith’s School of Food and Wine in London before working at the world famous Harvey’s restaurant. Harvey’s iconic status at the time was cemented by co-owner and chef Marco Pierre White who became the youngest ever chef to be awarded two michelin stars. Marco later became the second youngest chef to win 3 michelin stars. Many other well known chefs trained under Marco, including Gordon Ramsay, Eric Chavot, Stephen Terry, Philip Howard, all of whom earned their own stars, and Harvey’s was known as one of the most innovative kitchens of its time. Jane went on to cook for the Formula One teams Ferrari and McLaren, cooking for the teams and their sponsors all over the world, producing sublime food in often challenging circumstances. She went on to open a hotel and restaurant in the Cotswolds with her husband. The Dial House was voted by Which Guides in 2005 as Hotel of the Year. They sold the business in 2007 before heading to Marrakech. After running Riad El Fenn alongside her husband, the pair returned to England to open The Society Café in Bath. Their new business is growing and they hope to have their third location open by the end of this year. We are over the moon to have her back, and to be able to explore Moroccan food and flavours and inspiration as part of this series. Sanssouci Collection consists of a cooking school and two riad boutique hotels: Dar Les Cigognes and Riad Kaiss. Since 2000, we have been focussed on exploring Moroccan culture through its cuisine. During 2015, we will be inviting a number of different chefs to come and be inspired by what they see in Morocco, and to create unique dinners. We hope that you will join us as we explore together a future vision of Moroccan cooking. Spaces are extremely limited, so please contact us to book. Reservations are required. Call +212 524 38 27 40 or email info@sanssoucicollection.com. Dinner on Friday and Saturday, the 27th and 28th of February, 19:30 for 20:00. Very excited to announce the first in our series of 2015 pop-up dinners. Throughout 2015, Sanssouci Cooking School will be hosting a series of guest chefs with whom we will be exploring Moroccan cuisine and culture, and creating an inspiring series of new dishes. The first chef in the line-up is the talented chef Celeste Pianezzola coming to us from New Zealand who will be displaying her talents on Saturday evening the 7th of February at Dar Les Cigognes, where she and the Sanssouci Cooking school team will be serving a dinner inspired by the mingling of Celeste’s unique take on the world of food and Moroccan flavours. Celeste trained under some of the most famous chefs in New Zealand and Australia before taking the helm at Olive, where she gained a following for her artistry with the grill. She looks forward to applying her skill and unique approach to grilling with us at Les Cigognes. This is an intimate event, and places are limited to just 24 guests, so please drop us a line at info@sanssoucicollection.com or call +212 524 38 27 40 or 47 67. Celeste will be cooking on one night only. Dinner is 600 dhs per person excluding drinks. 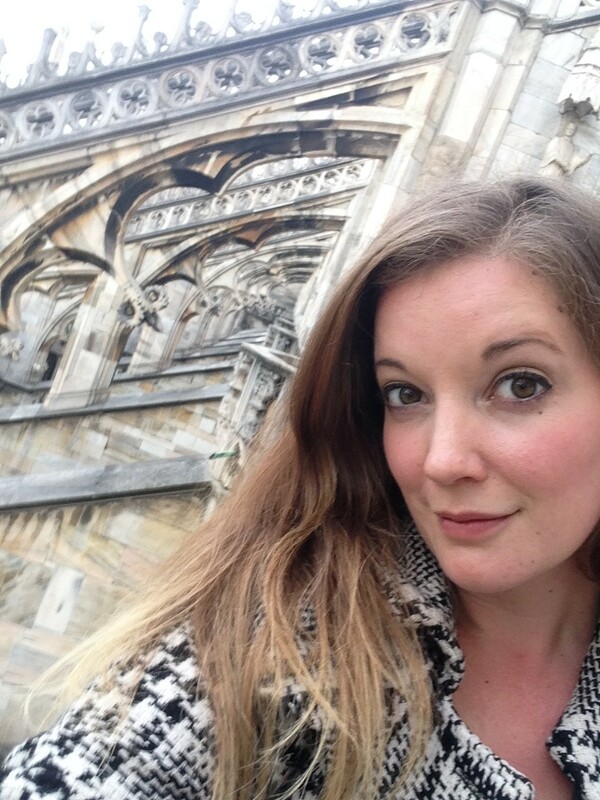 Utah born and raised, Celeste felt the urge to travel at a young age. After 3 years of training to be a carpenter, Celeste Pianezzola turned to cooking. Cooking gave her wings to fly around the world and she has absorbed and studied many different cuisines of the world. It is this diversity that gives depth to her creations. The eye for detail and precision she learned as a carpenter also served her well, and brought a whole new element of construction to her food. She first started building a name for herself in Melbourne Australia, a mecca for foodies and chefs. There she was the head chef at a waterfront cafe called My Sister Says, and spent her nights sneaking into the finest kitchens and learning from the best. Among them was Vue de Monde, Cumulus, and Attica. From Australia she headed to South East Asia where she studied ancient methods of cooking in the southern rainforests of Thailand, and slowly wandered up into Vietnam where she ate and studied food in Hanoi and Sapa Valley. Two years later she emerged from the jungle and settled in Wellington, New Zealand where she worked with renowned chefs Charlie Noble and Martin Bosley at the White House. A short detour brought her back to the west coast of the United States. After a short stint exploring the world of food trucks and street food, she settled down as chef at Olive Restaurant, where she took the city by storm cooking up elaborate and ever-changing seasonal menus on two charcoal grills. Her mastery of cooking with fire is renowned. She is now exploring the cooking of Morocco with us at Sanssouci. Sanssouci Collection consists of a cooking school and two riad hotels: Dar Les Cigognes and Riad Kaiss. Since 2000, we have been focussed on exploring Moroccan culture through its cuisine. As we head into our 15th year of Cooking Classes at the Sanssouci Collection Cooking School in Marrakech, we wanted to take a moment to thank the people who have participated in the classes over the years, to highlight some of the professionals who have joined us, and to look forward to the future. Paula Wolfert. No conversation about Moroccan cooking should not feature Paula Wolfert. One of the very first people to write about Moroccan food in English, her book The Food of Morocco, has most demonstrably stood the test of time, and her book remains the ultimate cookery bible for those interested in Moroccan cuisine, the food culture of the country, regional and obscure specialities, and recipes that really work. Her book was re-issued recently with gorgeous new photography by Quentin Bacon, one of the world’s best food photographers. Mourad Lahlou. Winner of Iron Chef, and the first Moroccan to earn a Michelin star, self-taught Mourad is a leading light in the Moroccan culinary pantheon. From his restaurant Aziza in San Francisco, he has been innovating and pushing the boundaries of what Moroccan Cuisine is all about for over a decade. His book New Moroccanis filled with fantastically original and creative recipes. Choumicha. She is quite possibly Morocco’s biggest television star, period. Her television shows, both on traditional Moroccan cooking and on more modern cooking and home management, inspire people across Morocco and Moroccan’s around the world pining away for the flavours of home. We have had the pleasure of doing two television shows with her. Yotam Ottolenghi and Sami Tamimi. We had the great pleasure to act as food consultants to the Channel 4 Series Ottolenghi’s Mediterranean Feasts. His wonderfully approachable style and fresh, light take on food was wonderful to see in action. 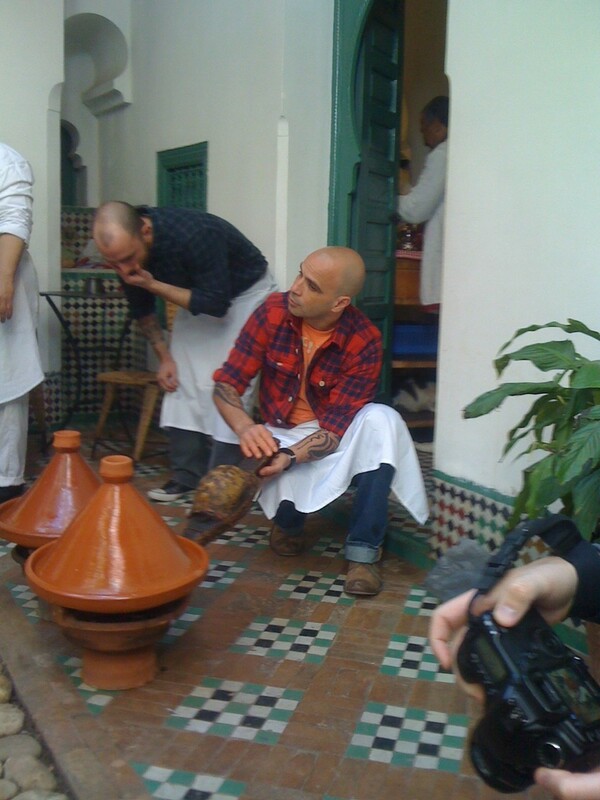 The Moroccan episode was filmed in part at Les Cigognes and Riad Kaiss. Hassan M’Souli. Recent winner of the best Paella in Australia, Hassan explained to us recently how close the technique of making the perfect paella is to the perfect tajine. 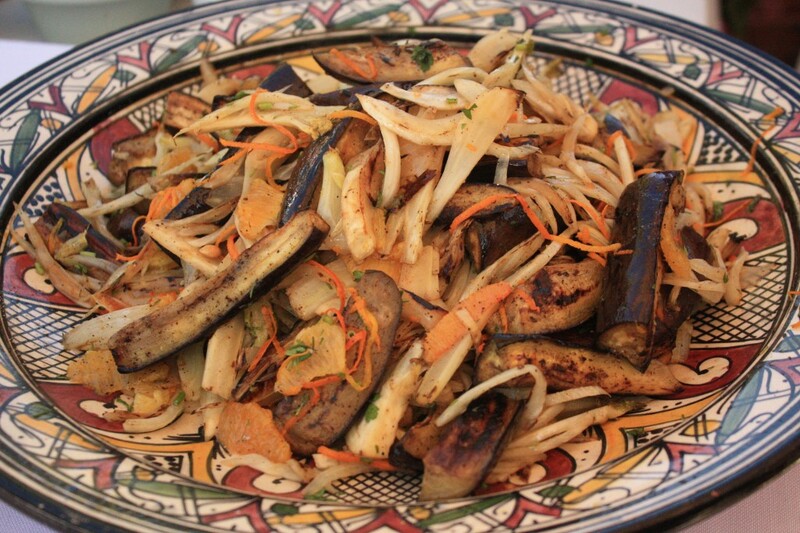 This classic of Spanish cuisine, however, is also found in the North of Morocco. 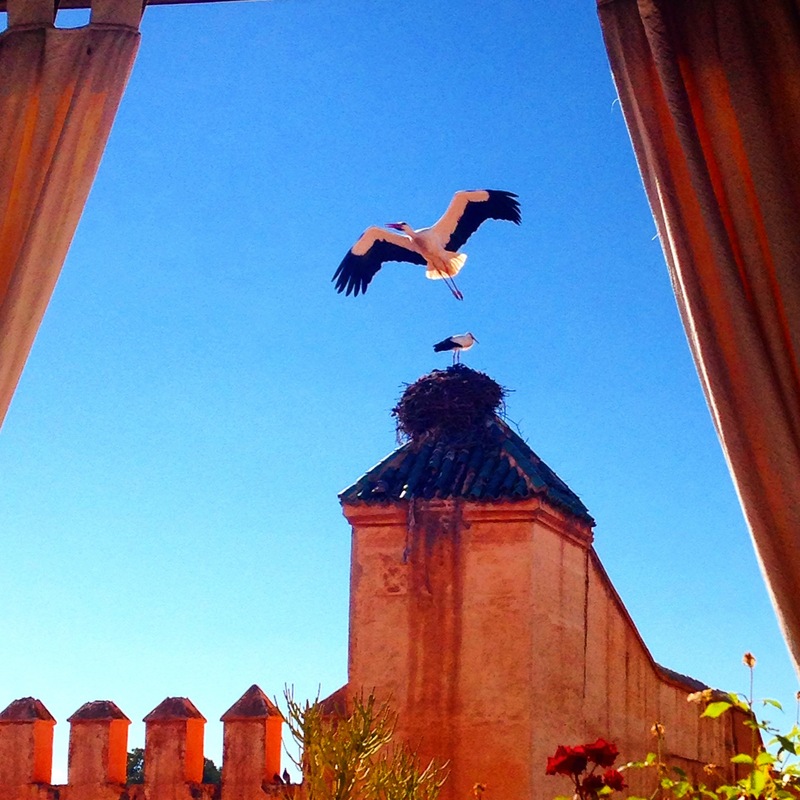 His famous paella and extensive list of Moroccan specialities are available at his Sidney restaurant, Out of Africa. His book Moroccan Modern was voted one of the best new cookbooks of 2012. Yoshiaki Kuno. Chef Kuno has been serving Mediterranean food at his Tokyo restaurants for many years, and for many locals and expats, it is one of the great addresses for a taste of this part of the world. He is also the first to regularly feature Moroccan dishes on his menu, and we are delighted to have been able to help him bring a touch of Morocco to Japan. John Quigley. Owner of Glasgow’s Red Onion, John has been turning out inspired modern fare for many years at his restaurant. We have exhorted friends to drop in and say hi. Sarah Scott. For fifteen years she was Executive Chef at the Robert Mondavi winery. Cooking alongside such greats as Jeremiah Tower, Alice Waters, Julia Child, Thomas Keller, Madeleine Kamman, she has done more than anyone to spread the word about Napa Valley’s approach to the culinary arts. In her wonderful book The Wild Table, she shares this fresh approach to cooking and ingredients. Keri Moss. Winner of Masterchef the Professionals in 2012, we had the great pleasure of hosting and working with her. Her down to earth style and creative approach to cooking are inspiring and we look forward to seeing her work and style evolve over the coming years. Sophia and Rob Thomasset. Authors of the sensational new pan-Moroccan book Colours of Maroc, Sophia and Rob have captured Moroccan gastronomy from its humblest to its most divine. The book is a must-read for those who are interested in the cuisine of this great country. We are very much looking forward to 2015 with a new book on its way and a resident chef’s programme. Adapted from a recipe prepared and written by Keri Moss, winner of Masterchef 2012 The Professionals during her stay with the Sanssouci Collection Cooking School at Dar Les Cigognes. To participate in a future trip with Masterchef Travel and Sanssouci Collection, kindly contact us or Cox & Kings. Keri found inspiration from the seasonal produce on hand in the fresh food markets of Marrakech. This salad is a blend of the local bounty and her creative approach to the dish. Everyone knows the best way to get luminous skin is to go to a hammam and soap up with beldi, scrub with a kassa, and get a rhassoul mask. Everyone knows the way to get perfect hair is to wash it with henna and finish with argan oil. Everyone knows the quickest way to slim down is with turmeric, cumin, and green mint tea. What? You’ve never heard of this stuff? Ah, come to Morocco, we will teach you! Many of the most common health and beauty tips in Morocco are exotic mysteries to foreigners, but here we will give you a taste of the authentic local secrets. You can order many of these things online and try them at home, but to truly understand there’s only one way: you just have to come visit and get the full experience. 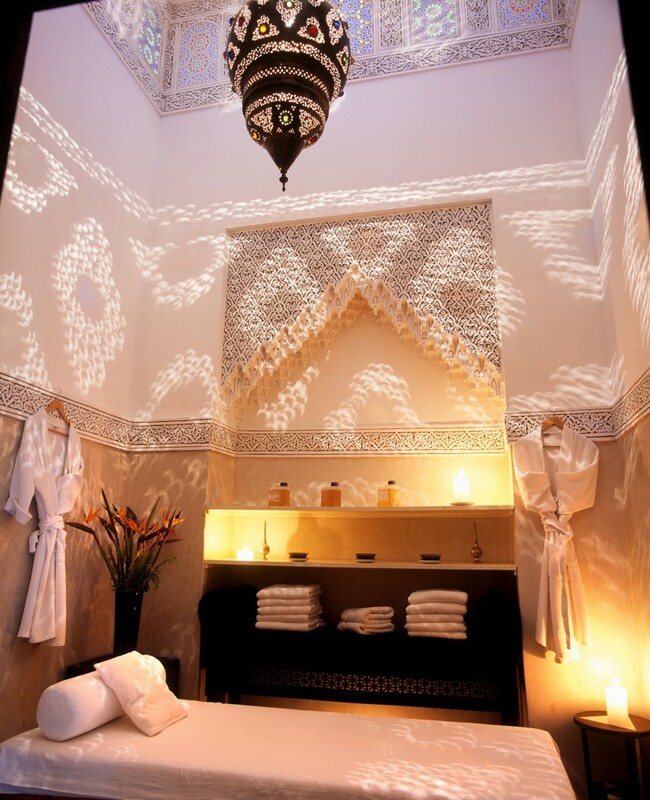 The central feature of the Moroccan beauty regime is the hammam, which is similar to a Turkish bath or a spa. A tranquil haven in which to shed the worries of the everyday, the hammam is also the setting for some of the best Moroccan skin- and hair-care tools. After letting the steam room open your pores, the first step in the hammam ritual is to lather your skin with beldi. Beldi is a smooth black soap with the consistency of butter. Made from crushed olives and olive oil, it is full of vitamin E for bright, healthy skin. It thoroughly moisturizes and nourishes your skin to get that lovely soft, silky feel. Cover your whole body in the creamy goo and leave it for 5-10 minutes to work its magic. Then comes the kassa, a rough glove used to scrub the whole body. Moroccan women know how to exfoliate: if you come to a hammam and pay for a scrub, a motherly woman with the strength of ten men will scour every inch of your skin with a kassa until it glows. After the beldi wash, dead skin sloughs off easily, and the kassa treatment will make you feel like a whole new person. Next is a rhassoul mask, a unique Moroccan treat. Rhassoul is a clay found only in the Atlas Mountains of Morocco with wonderful cosmetic advantages. It’s extremely absorbent, and though it normally comes in powder or small bars, it turns into a thick paste when mixed with water. Coat your skin in this rich mud to take advantage of its incredible properties: it tones and enriches skin, removing impurities and nourishing it with vital minerals. Finally, moisturize with argan oil. In Western countries this miracle product is often called Moroccan oil, since it comes from the argan tree which grows exclusively in Morocco. It’s recently risen in popularity as a hair treatment, but it’s also great for skin care. The silky oil is rich in proteins that keep skin elastic and help to prevent wrinkles. It’s great for dry skin, but surprisingly it’s also perfect for oily skin: argan oil helps to regulate the production of sebum in your skin. Now that your skin has been buffed and polished to perfection, it’s time to wash your hair. Henna is the plant for this job; it nourishes, moisturizes, and smoothes hair to leave it glossy and strong. You thought henna was only for painting pretty designs on hands and feet? Not so! Like argan oil, it regulates sebum production, so it’s just as good for oily hair as dry hair. It also helps add volume to fine hair. For dry or curly hair, you should finish with more argan oil to smooth split ends and moisturize without weighing hair down or making it look greasy. But the cosmetic wisdom of Morocco doesn’t stop when you leave the hammam. Here are a few great diet tips straight from Marrakech: turmeric is a great spice for boosting your metabolism and flushing toxins from the liver. It can also help to lower blood sugar. Feeling bloated? Moroccans know cumin is the answer. It stimulates enzymes that help to break down food more efficiently, easing digestion and preventing gas and bloating. Of course, the best turmeric and cumin is sold at the spice markets in Marrakech. Finally, green mint tea is perfect for flushing toxins from your system and making you look and feel younger. It’s traditional to drink green mint tea with every meal in Morocco, and it’s not uncommon for merchants to insist you sit with them for a glass of tea while having a friendly debate over the price of their wares. As we’ve mentioned, most of these things can be found online or at your local health food store. You can bring a small piece of Morocco home with you to try to recreate the effect. But that will not be the authentic experience. You cannot truly understand the beauty and vitality beating at the heart of Morocco until you come visit us and immerse yourself completely in the wonders and delights of Marrakech. Dar Les Cigognes recently hosted an episode of “Anna & Kristina’s Grocery Bag” a TV show distributed globally on the Oprah Winfrey Network. The show takes a hot new cookbook by a major chef and then cooks from it. Invited to taste their cooking is a globally recognised expert in the cuisine of choice. The book that brought this show to Morocco was the wonderful book by Mourad Lahlou, “New Morocco”. Mourad’s book has received many awards, including best new cookbook of 2012. Mourad himself has also been awarded a Michelin star, and his book is a gem of fresh approaches to Moroccan classics. The judge of the show is Choumicha, Morocco’s biggest TV star, and Morocco’s biggest food star. The show is an entertaining romp through the girls’ exploration of his recipes, and the fine cooking that results. Choumicha is duly impressed.